...have been tomatoes, beans, peas, zucchini and cucumber. 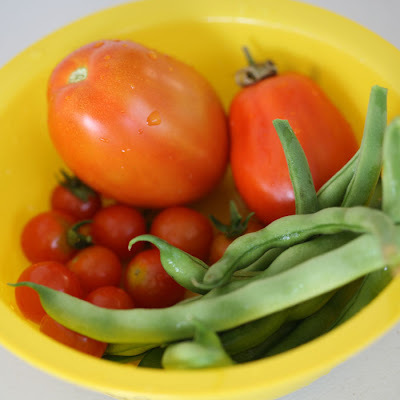 Here's a picture of some tomatoes and beans I picked recently. My advice to anyone who has never grown tomatoes or beans before is to plant them along the edge of your garden if it's enclosed with a fence (this is what I do, then simply tie them up against the fence). Either that or have long sticks and twine ready, or purchase plant "cages" from your local gardening store to support the plants.